Datuk Michelle Yeoh trades in her punches and high kicks for kimonos that might earn her an Oscar in Memoirs of a Geisha. Anticipation is running high among movie buffs over the upcoming release of Steven Spielberg's visually sumptuous movie version of the best-selling novel, Memoirs of a Geisha. Excitement should be especially rife among Malaysians, with early Oscar buzz surrounding Malaysia's Datuk Michelle Yeoh. Sony Pictures sources claim that Michelle delivers a tour-de-force performance in her role as Mameha, one of the three geishas - all played by Chinese actresses - in Arthur Golden's captivating tale of intrigue, jealousy and love in the Floating World, as the geisha profession was called. The Oscar hype, shouldn't come as a surprise, especially for those who have read the book, since the role of Mameha is a pivotal one. 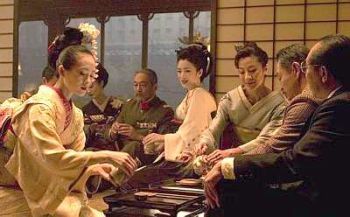 Zhang Ziyi (left), Gong Li (centre) and Michelle Yeoh (third from right) in their new movie Memoirs of a Geisha, and Zhang Ziyi (below) in a scene from the film. Michelle plays a seasoned geisha who mentors Sayuri (Zhang Ziyi) in the niceties of the centuries-old craft, while fending off the ruthless machinations of Hatsumomo, the reigning star of Gion, the celebrated geisha quarter. Gong Li, as the nemesis, senses that Sayuri's rising star will mean her own eclipse, and goes over the top to bring down her budding rival. The plot resonates of Sunset Boulevard in kimono, or even Judy Garland's vintage A Star is Born, with painted faces. Michelle's expected Best Supporting Actress nomination - hold the breath for a win - would mean a first for Malaysia in the history of Hollywood's Academy Awards. It could also mark the first time, in nearly 50 years, that an Asian actress joins the ranks of Oscar winners, since Miyoshi Umeki received a best Supporting Actress award in Sayonara. Mainland China actress Zhang has also been quoted as pinning her hopes for a Best Actress nomination for her lead role as Sayuri, the poverty-stricken fishing village girl sold into slavery and reaches the pinnacle of her craft. It could be a casting coup, an insider's joke or art imitating life. 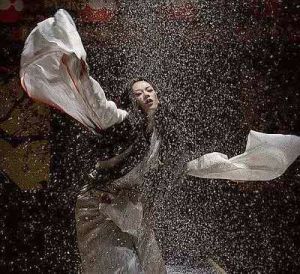 But the blockbuster, shot on a specially-built Japanese set in Los Angeles, and in Kyoto (Japan's ancient capital), pairs Zhang with Cannes award-winning actress Gong Li on-screen for the first time. Both are protegees - and more, rumours have claimed - of Chinese director Zhang Yimou. In her early days, Zhang was referred to as "Little Gong Li". Whether their alleged rivalry will be nuanced into the clash of characters in Geisha, will be closely watched by their fans. The movie, based on Golden's interviews with a real-life geisha, also marks the second movie collaboration between Michelle and Zhang. The actresses first squared off in the epic Crouching Tiger, Hidden Dragon, and reprise their older sister/budding woman relationship, minus the dark side of Zhang's character in the Ang Lee movie. Zhang, Michelle and Gong Li are formidable thespians whose mettle has been tested in a repertoire of demanding roles, and proven at notable events such as Cannes and the British film awards. Geisha could put three Asian women together in contention, for the first time, for acting honours in the movie world's most famous awards - Hollywood's Oscars.